Have you heard about the Wholly Guacamole Be a Hero Tshirt? When you purchase one of the Tshirts 100% of the 10$ goes directly to sending military kids to camp. The camp is for military kids. The camp gives military kids a chance to hang out and play with other kids whose mom and/or dad are also in the military. Be a HERO, get a shirt and two FREE Wholly Guacamole® coupons! Help us send 100 military kids to summer camp. 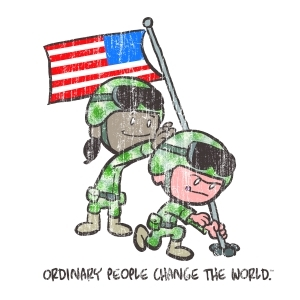 The Wholly Guacamole company teamed up with Brad Meltzer, founder of Ordinary People Change the World and Operation Purple®, a program of the National Military Family Association. Please help us reach our goal! Each shirt is $10 and the ENTIRE $10 goes towards our goal! You can find out more on how to be a Wholly Hero by checking out the Wholly Hero website. Paul Frank Tshirts & Personalized iPhone Cover for Summer Fun! what a clever idea this is. military kids getting to hang out with other military kids. brilliant!